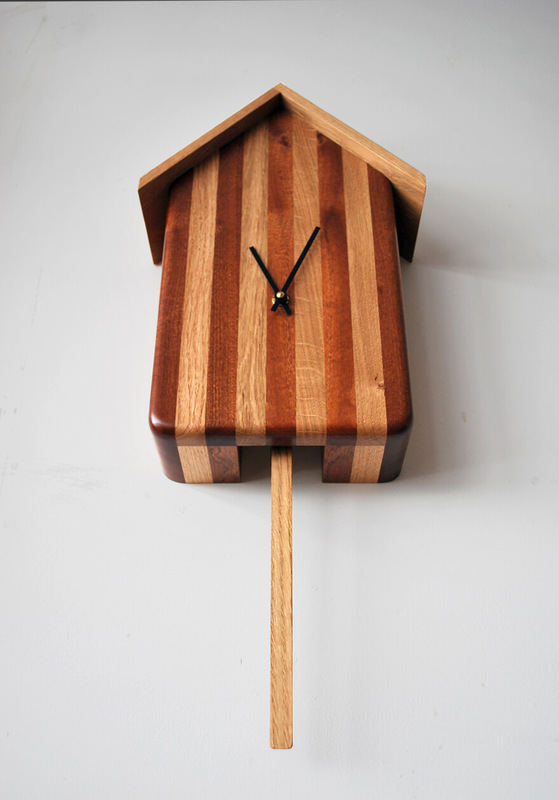 ∙ Wooden Cuckoo clock without the noisy cuckoo. ∙ Hand-made using solid Oak and Utile. A modern take on the classic Cuckoo Clock without the noisy cuckoo! Perfect for the modern or classic home alike, our quirky clocks with ticking pendulum are a celebration of the stunning colour and grain found in Oak and Utile timbers. The contrast between the two timbers is highlighted by using alternate strips of timber which are carefully selected and arranged to create a stunning ‘Humbug’ effect. Available as a limited edition range, our designer clocks are battery powered so no winding is required. Simply hang it up on a single screw and enjoy the quiet ticking of the slender, swinging Oak pendulum. Designed in house here at Boot&Saw, each wooden ‘Cuckoo-less Clock’ is crafted from solid fsc approved timber and is finished with Danish Oil and Bees’ Wax for a stunning sheen. Bespoke and custom Cuckoo-less Clocks available on request.